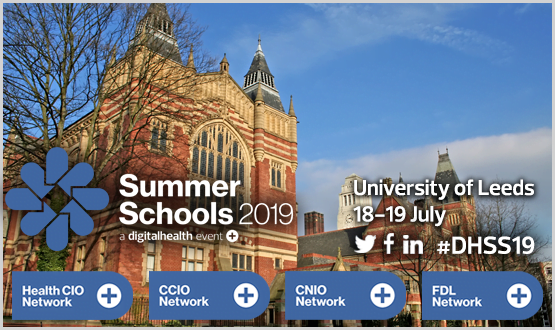 The Digital Health Summer Schools are the most popular and prestigious health IT leadership events of the year, and will be held at the University of Leeds, 18-19 July. This year, the Summer Schools is comprised of the Health CIO, CCIO, CNIO, Future Digital Leaders and Left Shift Summer Schools. This is your chance to join fellow CIOs, CCIOs, clinical information leaders, CNIOs and Future Digital Leaders for two days of protected networking, best practice, education and collaboration. Sessions are CPD accredited. Tickets are on sale for Summer Schools 2019 with Early Bird discount and bursaries available until 25 April. Visit the Digital Health Summer Schools website for more details. The Summer Schools Hack Day returns for an intensive two days of innovation, enabling participants to develop working proof of concepts. As an intertwining fringe event, the Hack day will run from Wednesday 17 July and will culminate in a presentation of projects at the Summer Schools on Thursday 18 July. Registrations opening soon. Great opportunity to meet like minded and those working in similar sectors- it has a really informal and collaborative feel. Lesley Holdworth, Clinical Lead for digital health and care, Scottish Government. The sixth really good annual Summer School meeting I have attended. And things just get better with time. Colin Brown, CCIO, Morecambe Bay Hospitals. Brilliant to meet such a great group of like minded clinicians and digital leads. All the sessions were thought and conversation provoking, the overall event organisation was exceptional making it a great experience. David Chalkley, Deputy CCIO and Digital Clinical Safety Lead, Taunton and Somerset NHS FT. Excellent 2 days, great speakers, great people and great fun. Jane Hayward, Director of Transformation, University Hospital Southampton FT. Excellent event in all aspects. Networking opportunities superb. Accommodation, catering and social amenities outstanding. Jill Tickle, EPR Lead Nurse, Northern Lincolnshire and Goole NHS FT.